FILE - Democratic Republic of the Congo's President Joseph Kabila and First Lady Marie Olive Lembe attend the anniversary celebrations of Congo's independence from Belgium in Kindu, the capital of Maniema province in the Democratic Republic of Congo, June 30, 2016. In less than two weeks, Kabila’s second and, under the constitution, final term will end. But he will not be giving up power. Elections slated for last month were not organized, and in October Kabila’s political alliance, the presidential majority, struck an agreement with an opposition faction that permits the president to stay in office until polls can be held. They have been provisionally scheduled for April 2018. FILE - Congolese opposition supporters chant slogans during a march to press President Joseph Kabila to step down in the Democratic Republic of Congo's capital Kinshasa, Sept. 19, 2016. However, most opposition parties, most notably a large coalition called the Rassemblement, reject this arrangement. 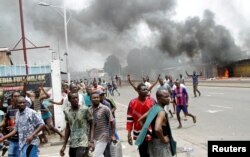 They want Kabila to step down as scheduled and for elections to be held next year. At Kabila’s instigation, CENCO, the influential body that represents the Catholic Church and is headed by Utembi, has been shuttling between the two sides since late October. It has taken more than five weeks to get the parties to nominate representatives and talk face to face. Martin Fayulu, another Rassemblement delegate, told VOA the question of who will rule the DRC after December 19 is on the table. Until now, however, neither Kabila nor his political alliance have given the impression that the president has any intention of relinquishing power before 2018 at the earliest, or that they are willing to contemplate having elections in 2017. Kamitatu told VOA time is fast running out for the negotiators. If a compromise cannot be found before December 19, many fear a repeat of September 19, when a Rassemblement demonstration turned violent. According to the U.N., security forces killed more than 50 people over two days.